John works outside in the HOT Arizona weather. He also does a lot of lifting, bending, walking, kneeling, and more. John installs synthetic grass. So he often comes home very tired and very sore. Typically he takes a nice relaxing shower right after walking in the door. A while back he used to take soaking baths with epson salt. But he stopped and for reasons I don't know and has been sticking to showers. When I found out about Muscle Soak Bath Salts I knew I need to get some for review. Infused with eucalyptus & Peppermint for optimal results, muscle soak bath salt contains pure epsom salt: magnesium-sulfate, tow vital elements in the body. Excess adrenaline and stress are believed to drain Magnesium which is essential for easing muscle aches & pains, flushing toxins & improving nerve function by regulating electrolytes. Magnesium is also necessary for the body to produce adequate amounts of serotonin, a mood-elevating chemical that creates a feeling of well-being & relaxation. Sulfates play a vital role in the formation of brain tissue & joint proteins and are readily absorbed through the skin. John was very interested in the Muscle Soak Bath Salts and couldn't wait to get in a tub and try them out. The Muscle soak helps to sooth John's overworked muscles. I would love to try some of their other varieties of bath salts. 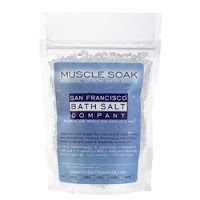 The San Francisco Bath Salt Company has a large array of bath essentials. Follow The San Francisco Bath Salt Company on Twitter and facebook.